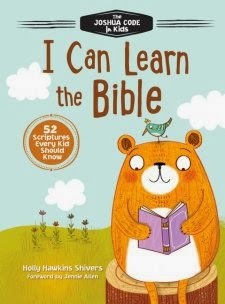 I Can Learn the Bible by Holly Hawkins Shivers is a 52-week devotional for children. Each week, a Scripture verse is featured for kids to commit to memory. An adaptation of O. S. Hawkins' The Joshua Code, I Can Learn the Bible has been adapted into a special resource especially for young children and their parents. This book is appealing in a number of ways. It is nicely designed in hardback, with colorful graphics and fun characters that appealed to my son right away. He commented that the illustrations are so cute, and he was enticed to pick the book up and start flipping through it before I had a chance to even tell him about it. Not to "judge a book by its cover," it is important to me that materials are high quality and appealing to my kids so that they'll want to delve into them. "There is nothing like the Word of God being planted in their hearts, taking root, and producing genuine spiritual growth" (p. 11). Each weekly section begins with a verse, then a brief devotional, followed by questions and answers for further understanding. The author suggests that parents present the verse on the first day of the week, and then spend the next few days breaking the verse down and learning it in pieces. By the end of the week, kids should be about to recite the entire verse. The Appendix includes tips for helping kids with memorization. At the end of the year, so much of the Bible will be "planted in their hearts!"